Note: If you’ve got a handstand pushup, use it! Weight for the deadlift is 50% of your 1RM (one rep max). Compare this time to your effort on July 17, 2012. Use the same weight or heavier. 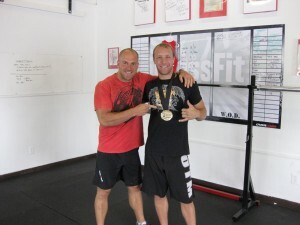 Congratulations to CrossFit Amundson Athlete Nathan Memdelsohn on his gold medal victory at the Las Vegas Open International Brazilian Jiu Jitsu Federation Competition held on Saturday, August 11, 2012. Nathan took the gold in the Brown Belt division in the middleweight weight class. Nathan has become an integral part of the CrossFit Amundson family. Awesome job Nathan, we are all stoked for your success!